QuikTrip (QT to his friends) Has stepped up their game so fast and so hard since hitting Texas a few years ago. Most have converted to the QT Kitchens concept which offers made-to-order items such as pizzas and pretzels and breakfast sammiches. 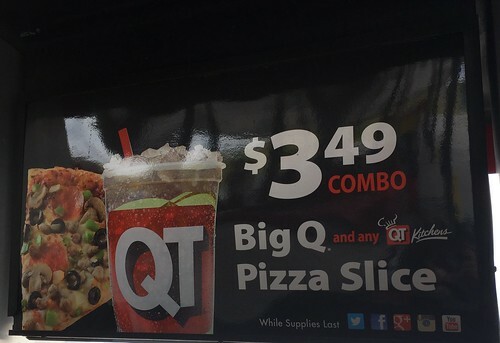 This $3.49 combo is a killer deal. You get a 32oz drink of choice and a pretty nice sized slice of pizza. It’s cheaper than any fast food combo or mall-food-court deal you will find. It’s also ready to go for most of the day (I think they stop serving it around 10pm) so that is incredibly convenient and the pizza (available in pepperoni and supreme) is pretty good so if you haven’t tried it you should give it a shot the next time you are looking for some cheap eats that will fill you up!